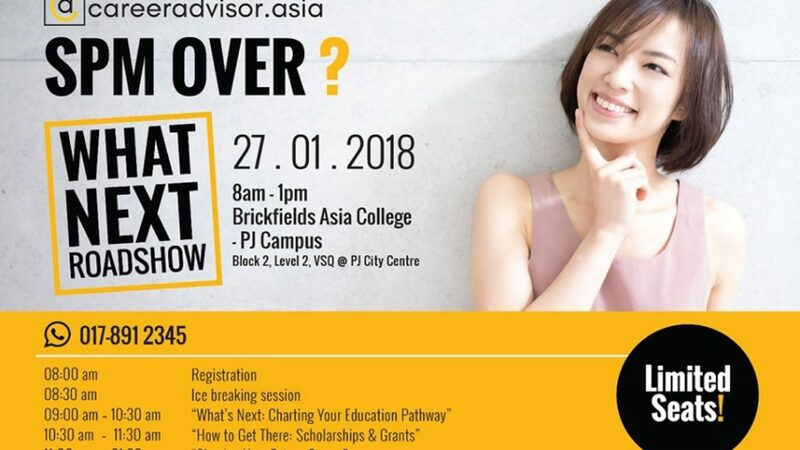 Kuala Lumpur, January 28, 2018 – Organised by CareerAdvisor.asia, the What Next Roadshow made its debut at Brickfields Asia College’s Petaling Jaya campus yesterday, drawing a sizeable crowd of school leavers and youths. This unique roadshow brought various colleges, universities and training institutions together to assist students to discover and chart their education pathways. Well-known creative thinking skills and critical thinking trainer Kumar Nagalingam, from the Skills Academy, introduced visitors to a free career aptitude test, which is used to determine an individual’s potential careers based on his/her personal strengths and weaknesses. He also helmed a session, “What’s Next: Charting Your Education Pathway”, during which he shared tips on planning for the future and explained the various careers available in different sectors. A separate session, “How to Get There: Scholarships & Grants”, enlightened participants on where and how to obtain financial aid, the eligibility requirements and the difference between scholarships and education loans. Visitors also received first-hand information on the courses offered by participating colleges and universities, and heard from industry experts in law, business & accounting, creative communications, science, education & social sciences and ICT sectors, who offered insight into careers in their respective areas of expertise. Managing Director of BAC Education Group Raja Singham lauded the What Next Roadshow, saying “We are glad to sponsor careeradvisor.asia’s What Next Roadshow as this is one initiative that gives our young people the opportunity to become relevant citizens upon graduation”. “There are some 40,000 Sijil Pelajaran Malaysia graduates each year and we need to create more avenues for them to choose the right career or be entrepreneurs,” he added. The What Next Roadshow will be held at 3 other cities across Peninsula Malaysia in the coming months, starting with Penang (March 19), followed by Ipoh (March 21) and Johor Bahru (March 24). For more information, please visit www.careeradvisor.asia/what-next.